Want to take advantage of the savings from buying in bulk but need some inspiration? Damaris Phillips, celebrity chef and host of Southern at Heart on the Food Network™, has partnered with the FoodSaver® brand to share some of her favorite ground beef recipes that can be prepped ahead, and then vacuum sealed and stored in the freezer until you're ready to eat. By using the FoodSaver® Food Preservation System, you don't have to worry about freezer burn or spoilage so you can buy in bulk and make several batches of a recipe ahead of time - ultimately saving money and time in the kitchen! Check out the recipes by Damaris Phillips for Beef Breakfast Sausage Patties and Taco Salad with Taco Meatballs below, and learn more about the FoodSaver® FM5000 Series 2-in-1 Food Preservation System. In the bowl of a stand mixer, combine the beef, the poultry seasoning, the sage, the onion powder, the salt, and the pepper. Mix on low to combine. Portion the sausage mixture using a heaping ¼ cup measure and flatten each sausage into a 3-inch round, about ¼-inch thick. You should have 16 (2 ounce) patties. Sear the sausages in the hot griddle pan until golden brown and cooked through, 3 to 5 minutes per side. 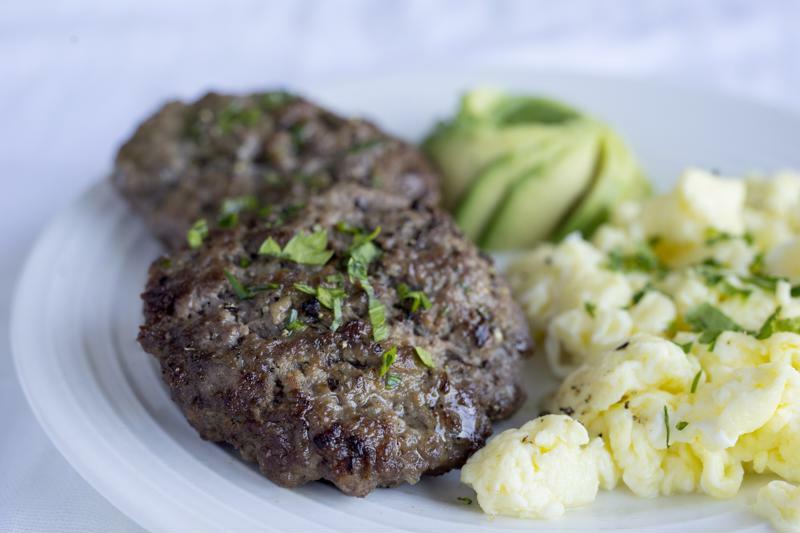 Want to prepare the patties ahead of time for a fast and easy breakfast option? Cool the patties completely and place inside a large FoodSaver® Vacuum Zipper Gallon Bag . Use your FoodSaver® FM5000 Series Food Preservation System to remove air from the bag, and store in the freezer. When ready to eat, takeout the desired number of patties, thaw and microwave for 90-120 seconds or reheat on a skillet over medium heat. Reseal the bag and place the remaining patties back in the freezer to enjoy later! In a large bowl whisk together the sour cream, mayonnaise, and lime juice. Stir in the cilantro and jalapeño pepper (consistency will be great for a dipping sauce). To thin, add water - 1 teaspoon at a time - until desired salad dressing consistency is reached. Season with salt and pepper. Add ¼ cup of dressing to the bottom of a 3-cup FoodSaver® Fresh Container - my go to containers to seal in flavor and preserve food. Layer the beans on top of the dressing, then the carrots. Next, make a red pepper layer, followed by corn, tomatoes and avocados. Finish by adding the lettuce to the top. Place the lid and secure the seal by removing air from the container with a FoodSaver® FM5000 Series Food Preservation System to ensure freshness. 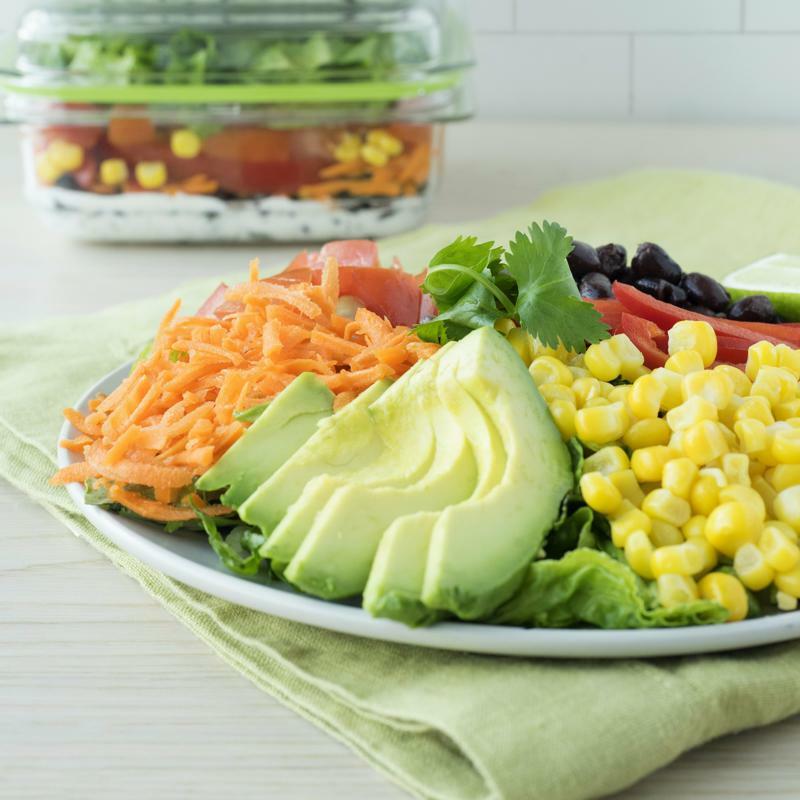 *Tip: Plan your meals for the week by portioning into 5 separate FoodSaver® Fresh Containers. Use FoodSaver® Produce Trays to help veggies stay crisp longer by separating them from moisture.